In a world of emails and status updates, the art of kids' thank you notes has been lost on today's children. From teens to kids too young to write, you can get kids of any age to show their appreciation through a simple thank you. 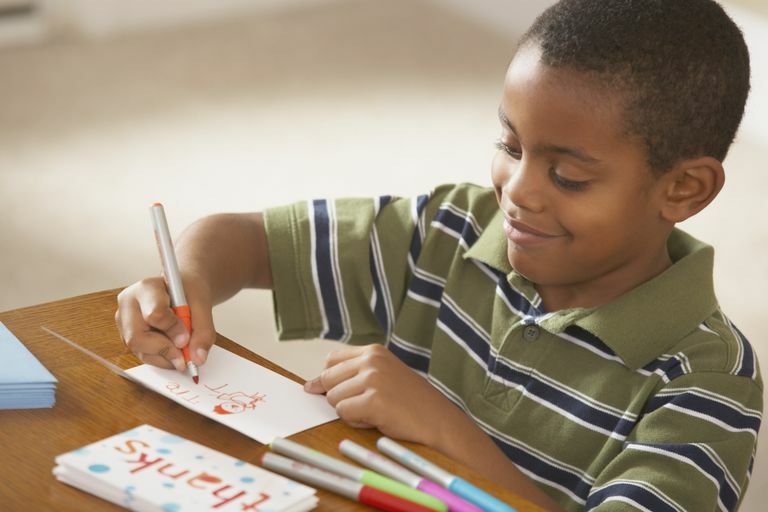 Try these 5 ways to encourage your kids to send thank you notes. Make your kids' thank you notes special for the recipient and your children. Personalized note cards with your child's name on each one can be pulled out just for thank you notes. School-age kids can write the thank you note themselves on their personalized note cards. For younger children, you can write the thank you card and have them write their name at the bottom or scribble a picture if they can't write their name just yet. Look for greeting cards with a recording chip. Let your kids record a personal greeting and make sure they say thank you in their recording. Even if you have to coach them while they're recording, they'll still send memorable thank yous. Taking the time to record a greeting can be an early step to teach young kids about thank you notes. It's also a nice keepsake for grandparents and other relatives. Kids too young to write can still send their version of a thank you note. Let them paint, attach stickers or color the inside of a greeting card or a piece of paper. There are many art projects you can try at home to make a simple thank you. Kids can also decorate the envelope as part of their art project. While your children create their notes, talk to them about why they're sending them. This gets kids started early on sending notes of thanks and understanding what it means to be appreciative. Take the time to make a personalized picture. This personalized picture can feature a collage of your child and it's a fun project for the whole family too. You can even take a picture of your child playing with or using the gift they received from the person you're sending the thank you card to. As an alternative, print photos of your child and have extras on hand when a birthday or holiday is coming up. That way, when your child receives a gift, you can slip in a picture of your child as a surprise bonus to the gift-giver. Children who are just learning to write may not be ready to write a full-length thank you card. But they can write their name and maybe even the addressee's name. You'll fill in the blanks for the rest of the card. For example, you write "Dear" and your child writes, "Aunt Susie." Then you write the rest of the card. Your child writes his own name at the bottom of the card. If you're sending thank you cards to friends or close relatives, ask them ahead of time if they would be willing to send your kids a note back. It can be a simple card that says, "Dear Johnny. I'm so happy to hear you love your new wagon. The next time I come over, I'll have to pull you around the neighborhood in it!" Children love getting mail. The correspondence will encourage them to put pen to paper every time they receive a gift or maybe even just to stay in touch without having to turn on the computer.